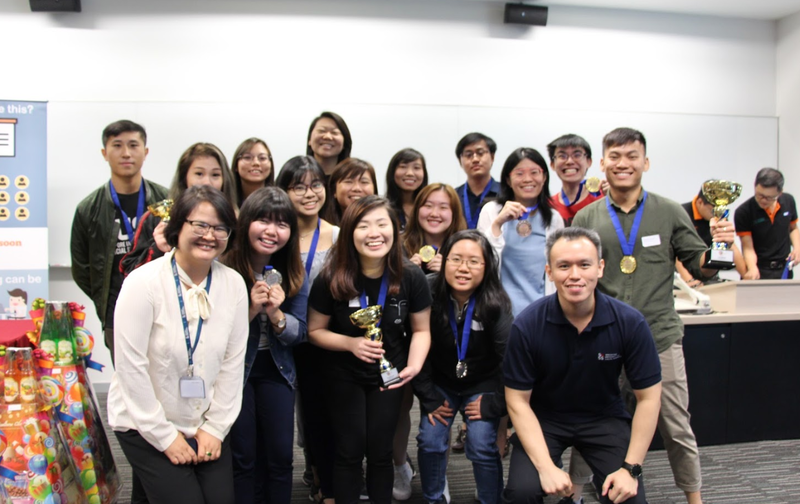 Clementi (Singapore) September 12, 2018 -- At the conclusion of MonsoonSIM Enterprise Resource Management Competition(MERMC) SUSS Final 2018 held this week in Singapore, 30 teams across 5 ASEAN countries plus Hong Kong will now prepare to challenge each other for the prestigious Regional Grand Final Prize to be conducted in Singapore on September 21st & 22nd. 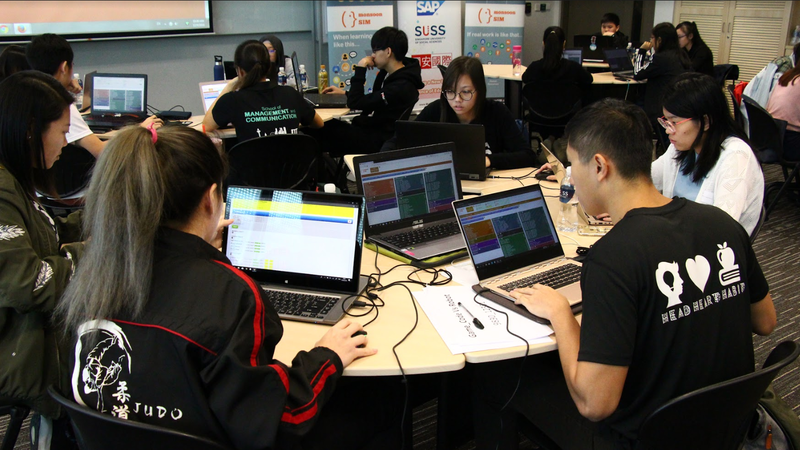 This week,19 teams comprising 95 students from four institutions across Singapore – Temasek Polytechnic, Republic Polytechnic(School of Infocomm), Kaplan Higher Education Institute, and Singapore University of Social Sciences(SUSS), participated in the Singapore SUSS Final competition. 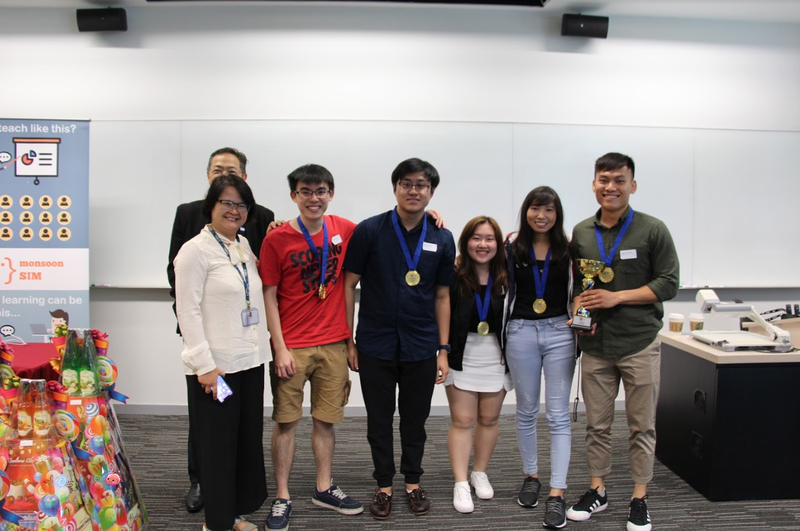 Participants in team-of-5 competed for the highest scores in this competition co-organized by the School of Business of SUSS and Monsoonsim Singapore Pte. Ltd. This year, Monsoon Academy is proud to present our latest innovation – the Man vs Robot challenge. The scores from this third ever challenge against the robots after Indonesia and Malaysia, constituted 20% of the total competition scores. 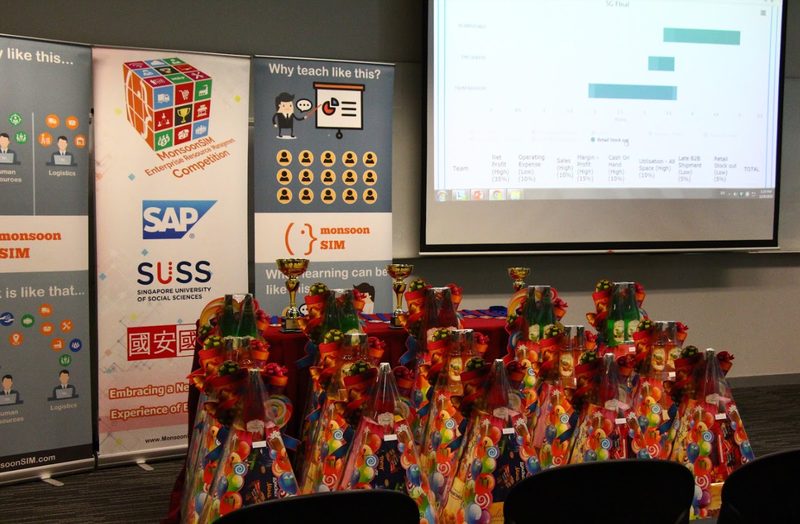 MERMC, an annual Business Process Simulation competition, is based on Monsoon Simulation, short for MonsoonSIM, a SAP endorsed Experiential Learning Platform developed to help students learn Enterprise Business Process involving Integrated ERP(Enterprise Resource Planning) concepts by performing various business transactions via Gamification. 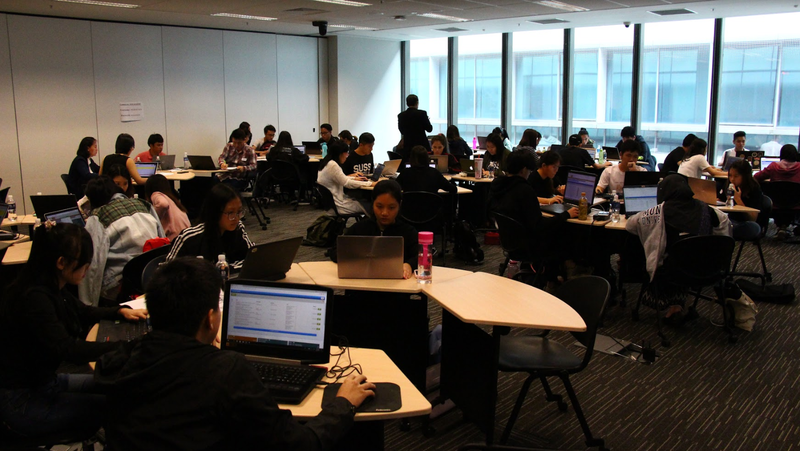 Through the fun and interactive cloud-based MonsoonSIM, students experience managing virtual companies in real time, and learn how 12 different business modules – production, material requirements planning, warehousing anod logistics, forecasting, procurement, asset maintenance, retail, wholesaling, marketing, customer service, human resources and finance – are interlinked. The 19 teams were divided into 2 groups, A and B with 10 and 9 in each in the qualifying round(semi-final). And the top 5 and top 4 of each group, a total of 9 teams, would each earn a place in the final round. Eager participants sprang into actions to challenge the robots in the first session of the qualifying round for the highest points possible as soon as the bells in 2 adjoining halls on the 4th floor of Building-C rang to kick off the start of the competition. 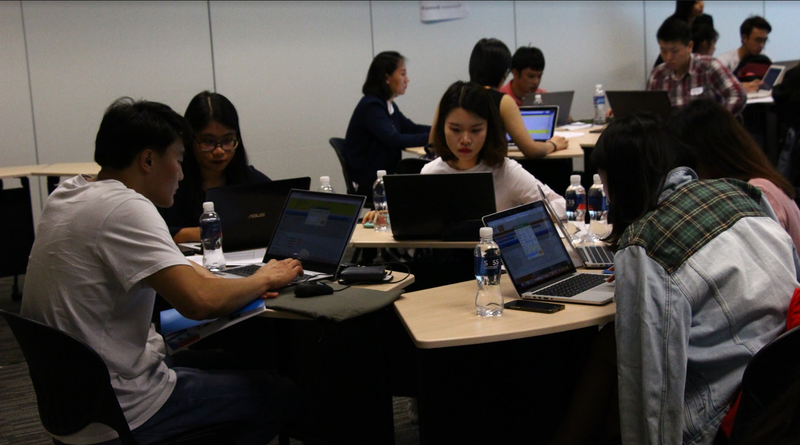 The second session, man vs man kicked off with Sir Alex Ong of Monsoonsim Singapore again facilitating the competition for all 19 teams in the 2 halls concurrently. 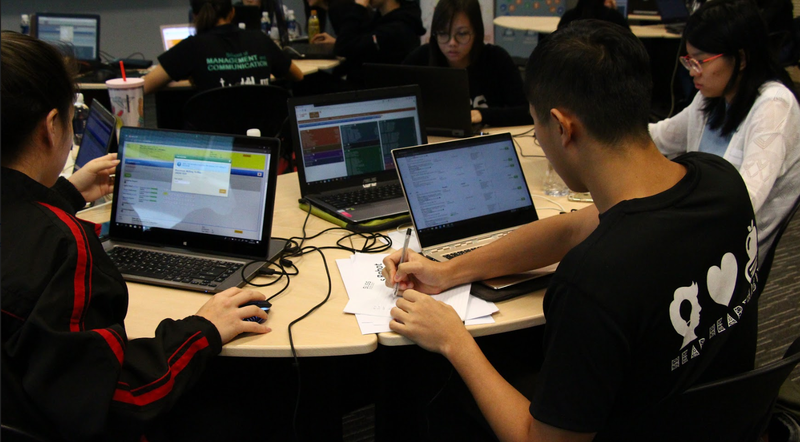 The teams worked towards the objective of running a successful virtual enterprise as they applied the business concepts they had learned and reacted quickly to situations based on practical constraints similar to real-life situations. At this time, unlike first-time players who are always exuberant and making noise, both halls became somewhat quiet. And at this time actually, a fierce simulation battle was already underway. After an intense battle, 5 top teams from Group A and 4 top teams from Group B emerged as finalists. The final battle for top spot of the day began after a short break. And the climax of this third and final 110 virtual days competition came in mid way after the top 3 teams broke away from the pack. At this point, while the rest were chasing, these 3 were battling it out in a see-sawing back and forth movements until the final 30 virtual days which saw Mission Impossible of SUSS moving ahead of the other 2 and the rest. At the end, all 3 managed to hold their positions while the rest wished they had more time. Coincidentally, the top three were all from SUSS. 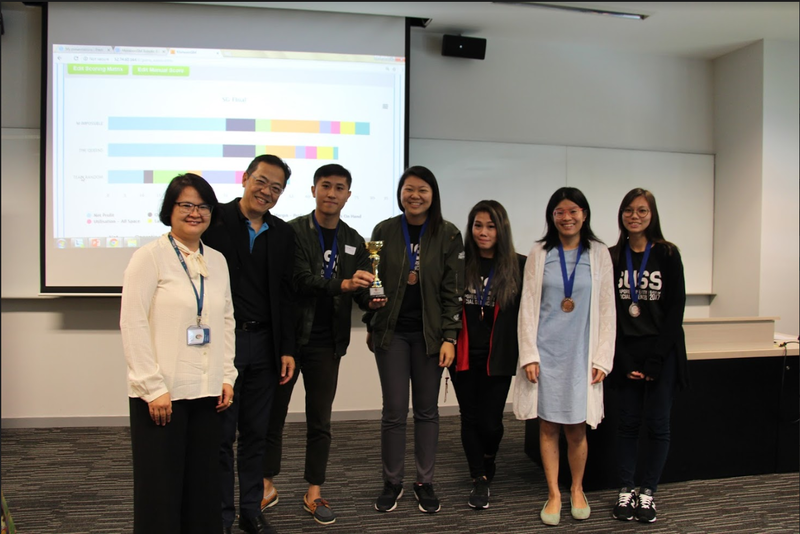 Nevertheless, regardless of their finishing order, all 9 teams will be representing Singapore and competing against 21 other teams from Hong Kong, Thailand, Malaysia, Indonesia, and the Philippines in the Regional Grand Final in Singapore University of Social Sciences(SUSS), Singapore on September 21st & 22nd. 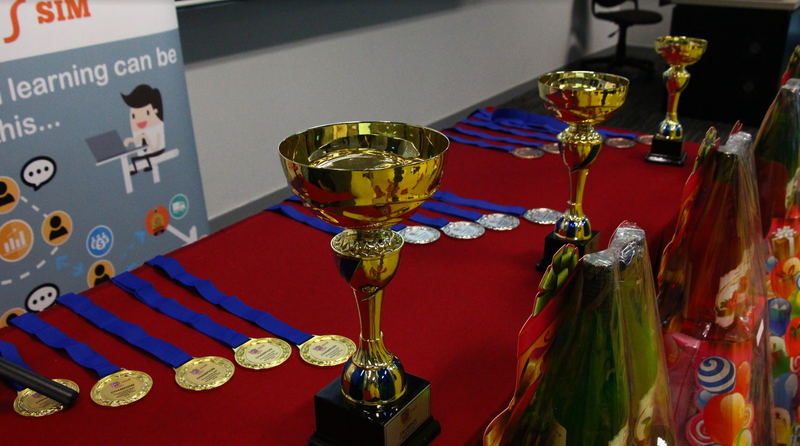 On top of the trophies and medals, MonsoonSIM and its sponsor also gave away prizes to the winners. The day ended with a high-spirited photo session and a lively buffet at the nice Bamboo Court of SUSS. We thank our host Provost Tsui Kai Chong and President Cheong Hee Kiat for their supports of MonsoonSIM, and their approval of this Singapore Final to be held at their prestigious university, SUSS. 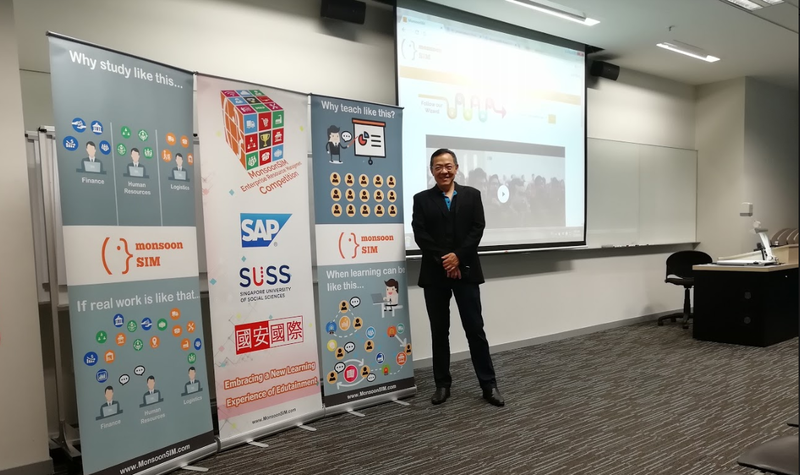 We thank Associate Prof Allan Chia Beng Hock, Vice-dean, School of Business(SBIZ), SUSS for the opening ceremony of the event and his support on MonsooSIM and Experiential learning..
We thank SAP Southeast Asia Education for its endorsement of MonsoonSIM, Guoan International Limited for its support, and Knowledgcom Corporation Sdn. Bhd. of Malaysia for the prizes sponsorship. We thank Dr. Jonathan Leong and his team at SUSS for their time and efforts in the organizing of this event. We thank all the participating universities for sending their students to the competition. We thank our President Mr. Abdy Taminsyah of Monsoon Academy for showcasing MonsoonSIM Robots, and for launching the Robotic Educational Bootcamp which involves 4 steps of learning that can be achieved through team-men vs team-robots, men and robots mixed, or one-on-one with robots at the students’ own pace, time, and comfort for Certification. 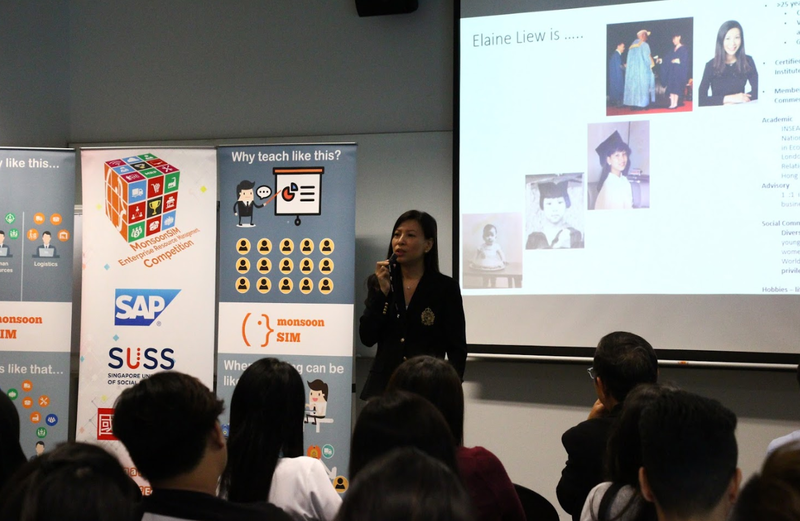 We thank Miss Elaine Liew, ex-Vice President of SAP Asia and former COO of IBM Cloud for sharing her learning experience as a student at school and as a professional for 30 years in the IT industry. Miss Liew believes Life-Long-Learning is needed to keep pace with society. Her message to students is that they must know how to see that Group, Community Global, and Collaboration just as MonsoonSIM promotes, are important criteria for success in today’s fast-paced world. Miss Liew pointed out that students should be appreciative of the new environment created through passion and provision by institution like SUSS, and supported by innovative company like Monsoon Academy. They help to provide the kind of platform that allows students to have the scope to be global, to have fun like competition, to have interactions with different schools as well as scopes that are ever evolving to tailor to the real world. According to her, studies have shown that Attention Span and Learning Retention are two things Professors at universities today like to talk about and focus on because it has been confirmed that pure courseware and lecture would kill every single level of passion and motivation. In other words, because of the existence of internet and social media, today’s students are very much interested in games, simulation, fun, thrill, and interaction in order to retain longer and sustainable learning. 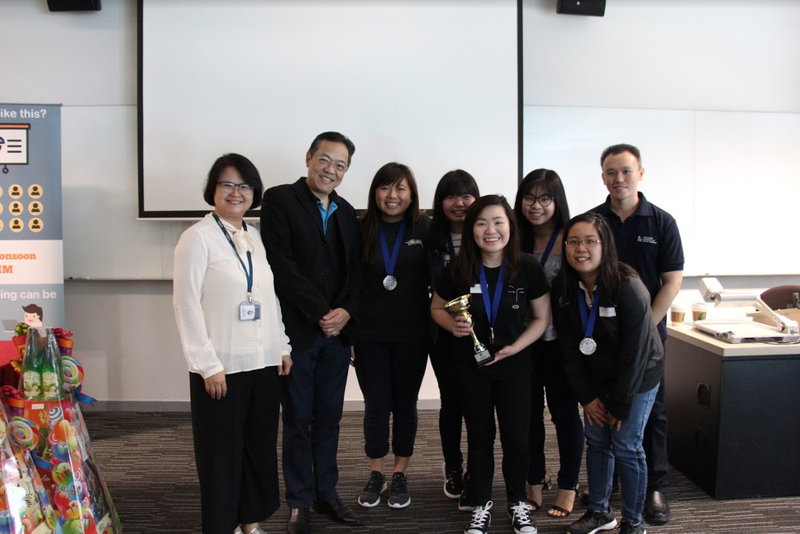 Miss Liew also said Game Competition Simulation stretches students minds through a combination of imaginations, stimulations, past experiences, contents that they learn, rules of the game, and tools that are given. 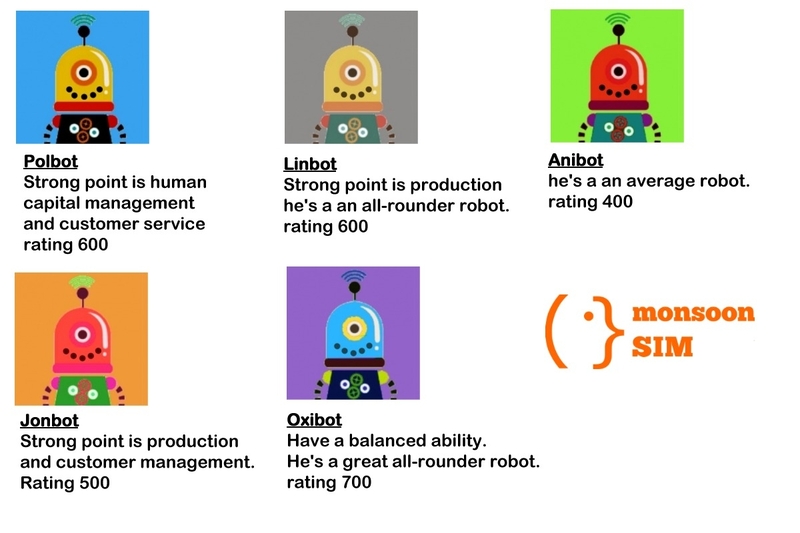 Besides, Game Competition Simulation can move them from Lonely to Group and Communal, from Static Courseware to Real World, from Limited Interaction to Unlimited Open Platform so that they can relate it right on the day when they start in society, they will be more attuned. Finally, we thank all the volunteers of SUSS. This event would not have been successful without their help. See you at SUSS in Singapore for the Regional Grand Final on Friday, September 21 and Saturday, September 22.